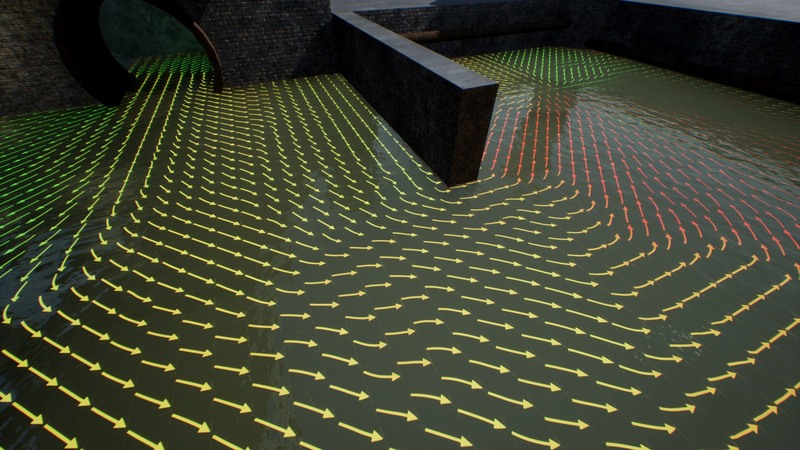 Aquatic Surface is an advanced water system composed of multiple specialized materials. Useful in making lakes and pools. 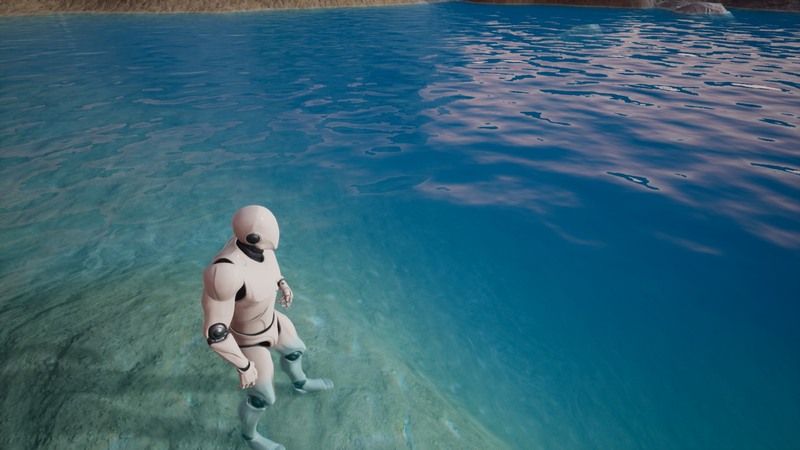 Aquatic Surface is a well optimized advanced material that implements configurable water effect. 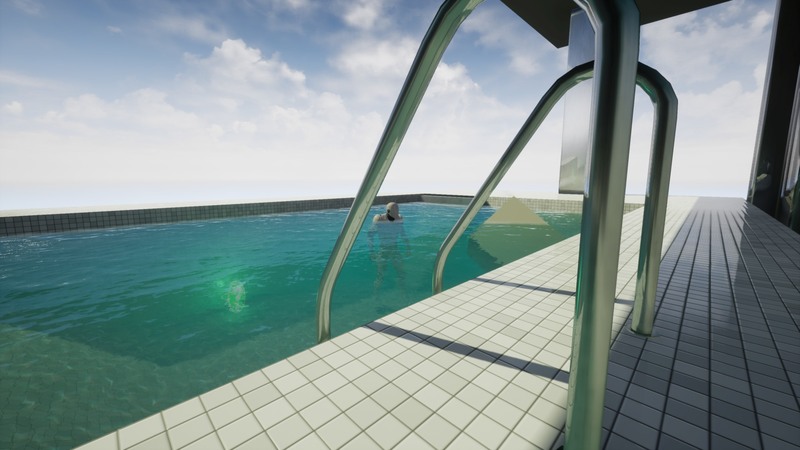 Over 100 parameters like translucency, fog depth, mapping, reflective, refraction, scattering, wet color. 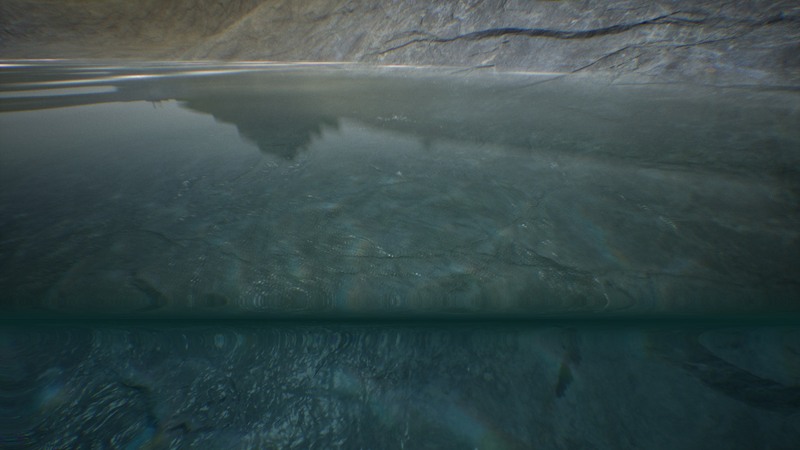 Separated onto 4 materials: overwater surface, underwater surface, in water post-process volume, caustics decal. Each of them can be used with other water systems. Very fast and GPU friendly. 120-160 instructions depend on used effects. The wet material on the character drying effect. If you have any suggestions please mail me or leave a comment. Fast simulated water interaction effect (single RT update 0.05 ms). 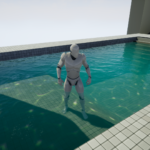 Added water interaction component that can be connected to every dynamic actor. 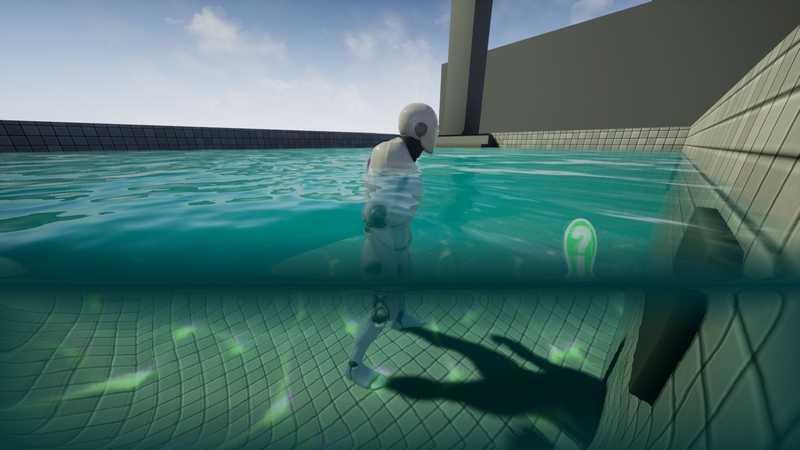 Added Lit water material template (no SSR only reflection captures). 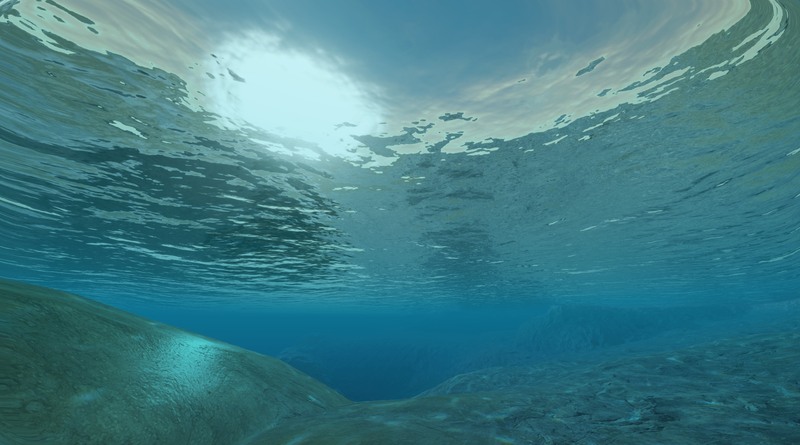 In Aquatic Surface package the water visualization is divided into multiple specialized material effects. Each layer of the effect can be separately configured to achieve incredible effects and can be used individually. Demo folder contains all assets prepared to showcase the example Maps. 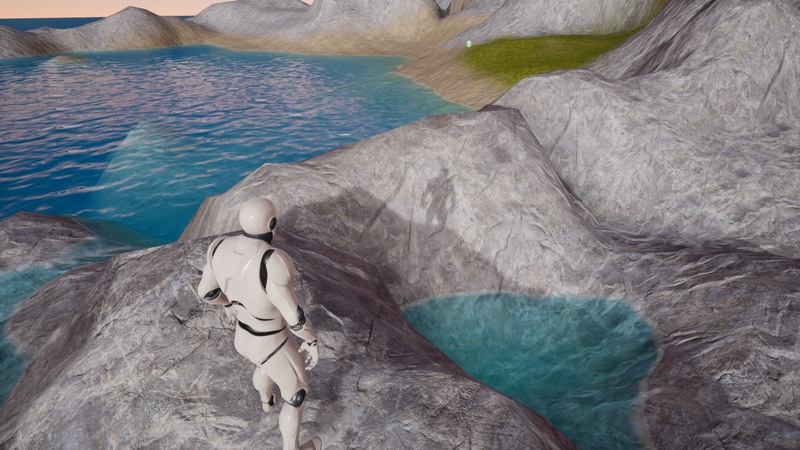 Check the example maps to see the possibilities of the Aquatic Surface system. Each example map uses its own template of water materials located in Template folder like Like/Reef/Pool. A template is a group of material instances created from Aquatic Surface master materials. For example, in folder Demo/Lake you can find material instances of materials used on LakeMap. 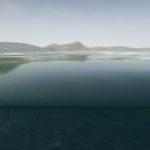 Those materials can be easily edited to achieve another visualization of lake water. Example materials in Aquatic Surface package. You can create your own material instances of water by duplicating the chosen template content or by using the editor option “Create Material Instance” on master materials located in Material directory. 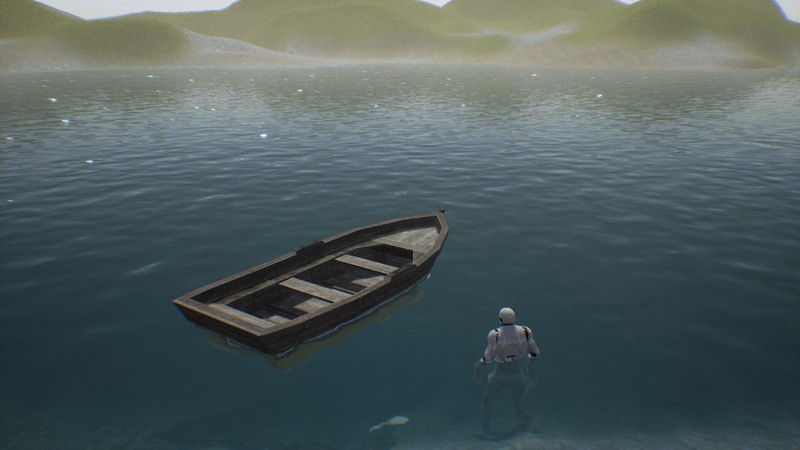 Chose the template of Aquatic Surface water that you want to use on your map. For example AquaticSurface/Demo/Templates/Reef. 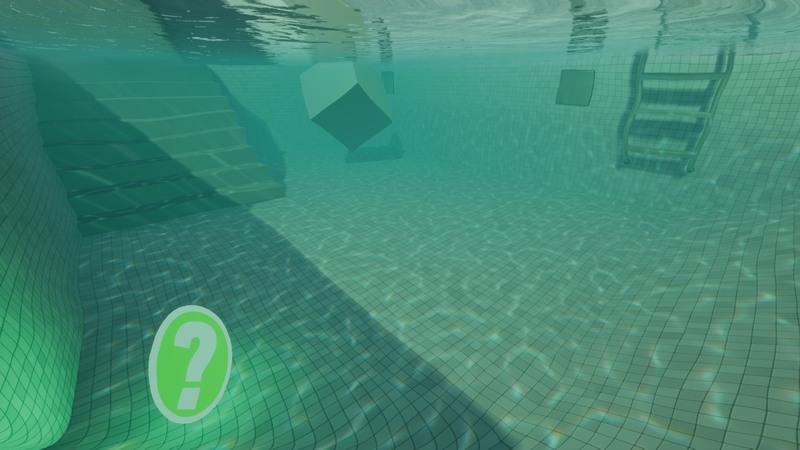 Drop the blueprint (/Demo/Templates/Reef/BP_AquaticSurface_Reef) of water on your level. 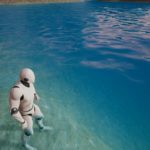 Modify the parameters of the blueprint to adjust the water to your map. 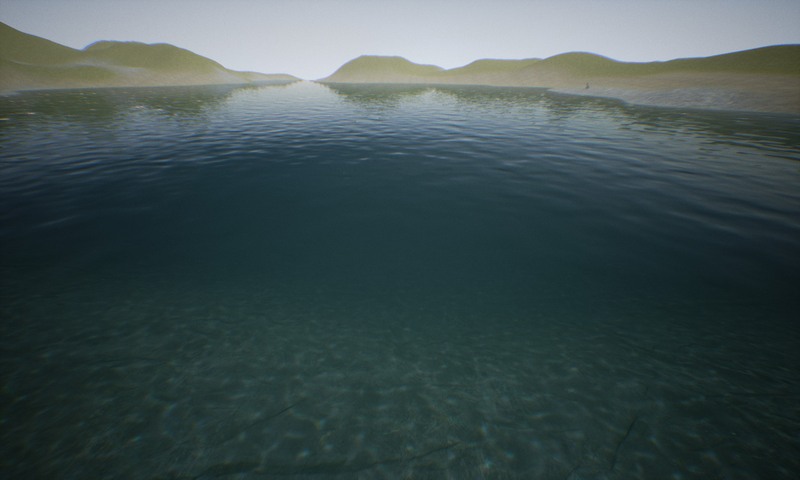 Especially it is important to set up bounds of reflection overwater/underwater and post-process volume size. 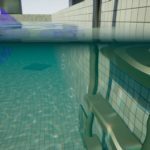 A detailed description can be found in Aquatic Surface Blueprint section. 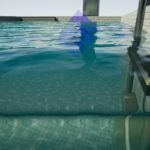 The BP_AquaticSurfce is a combination of underwater overwater and post-process materials that provides a user-friendly interface to configure water. Reconstruct Click to refresh the reflection texture and material parameters. Reconstruct the object. Over Water Material Material instance used on over the water surface. Under Water Material Material instance used on under the water surface. Volume Material Material instance used as fog volume of water. Near Plane Distance Clip plane distance. By default 10. Volume Box Extend Underwater pre-tranlucent volume box size. Volume Box Location Underwater pre-tranlucent volume box location. 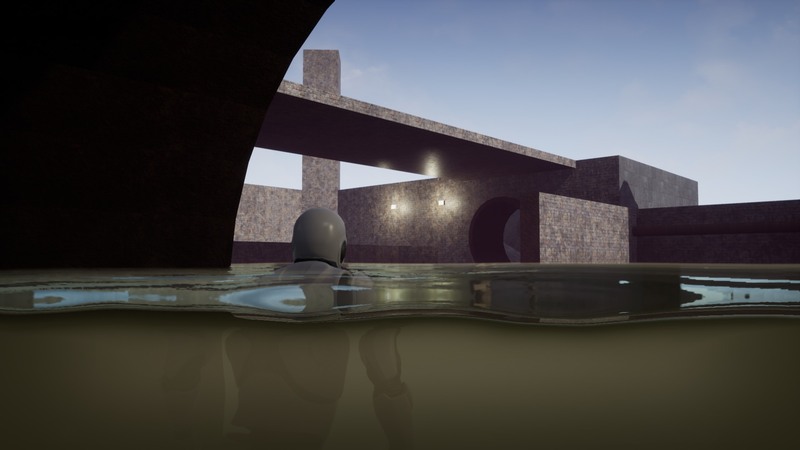 Reflection External External blueprint of reflection that can be shared between multiple water surfaces. Reflection Cubemap Static cube map reflection. Hidden In Reflection List of actors not rendered to reflection. Reflection Capture Delay Allows capturing reflection after start witch some small delay (after the content is loaded). The -1 value – never recapture. Reflection Source Location The point where the reflection capture was taken. Reflection Box Over Extend The size of the box used for surrounding cubemap used as over water. Reflection Box Over Location The central location of the box used for surrounding cubemap used in the underwater material. Reflection Box Under Extend The size of the box used for surrounding cubemap used as over water. Reflection Box Under Location The central location of the box used for surrounding cubemap used in the underwater material. Pay attention that M_AquaticScreen material should be set in PostProcess component in PostProcessMaterials array. 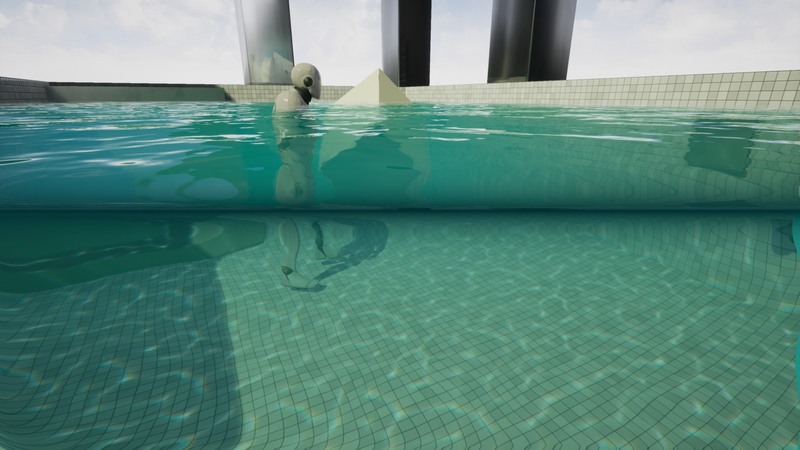 The M_AquaticOverWater is the material effect visible from over the water reflection refraction fresnel and depth. This material should be used on plane meshes aligned horizontally with normals directed upward. Find the M_AquaticOverWater* material that you want to modify from the example library of materials. Click right select duplicate option on the material. Rename to your water. It is good practice to have a clean naming convention like M_AquaticOverWater+River/Lake/Ocean. Put on your scene flat plane surface and apply the newly created material. 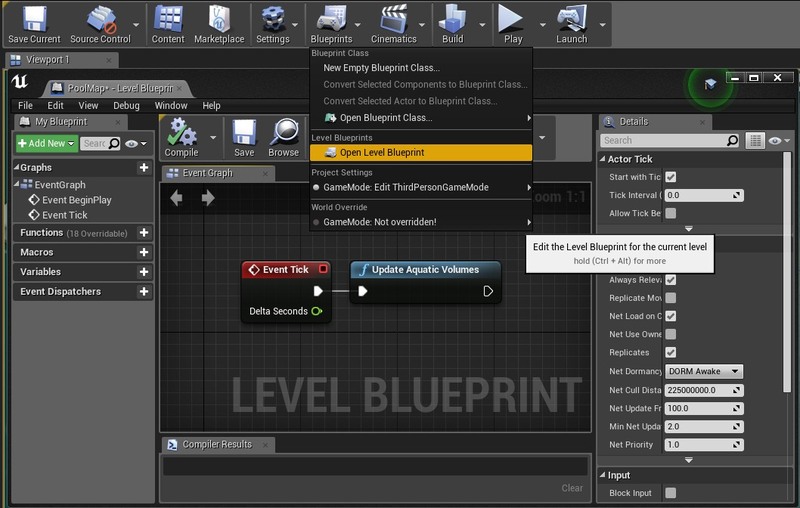 Open created material and edit parameters to customize for your scene. Fog Base Specifies the covering at which fog should starts. Fog Density Cover by fog depending on depth change. Fog Color Fog color when a mesh is fully covered. The exponential types provide more depth, more natural looking fog, and make the edges appear smoother. When disabled fog works in linear mode. Shadow Color The color multiplier on the ground from water shadow. Wet Color The color multiplier on the ground for simulating the wet material. 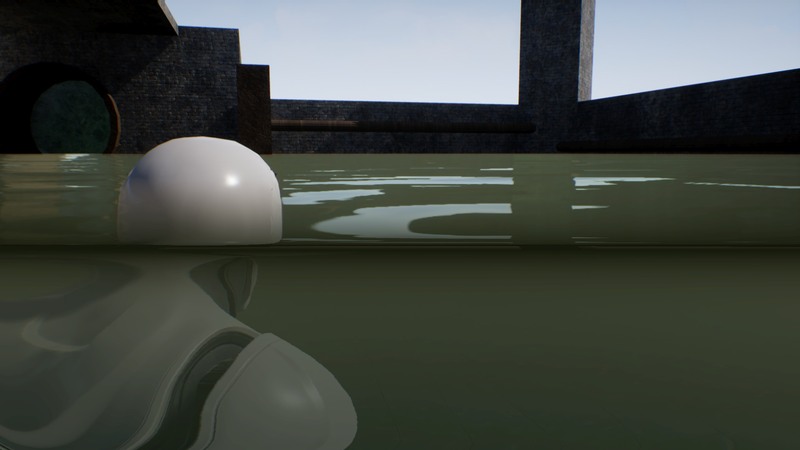 EmissiveReflection 0.0 Reflection will be applied to the base color when 1.0 it will be added to emissive. Parameter allows controlling how much sun color can affect the reflection. Refraction Color Surface refraction color multiplier. Use Shlick Reflection Enables physical based Shlicks fresnel calculations. Otherwise uses dot(camera, normal) based scale. Reflection Exp Exponential reflection. In the Shlick’s model of reflection, it is 5. Box Projection Extend Size of box projection. Use Box Projection Allows using box projection mapping. If disabled then system uses standard spherical cube-map projection. Cubemap Cubemap texture used on objects. By default connected to render target. Textures should be prebaked and saved in content. 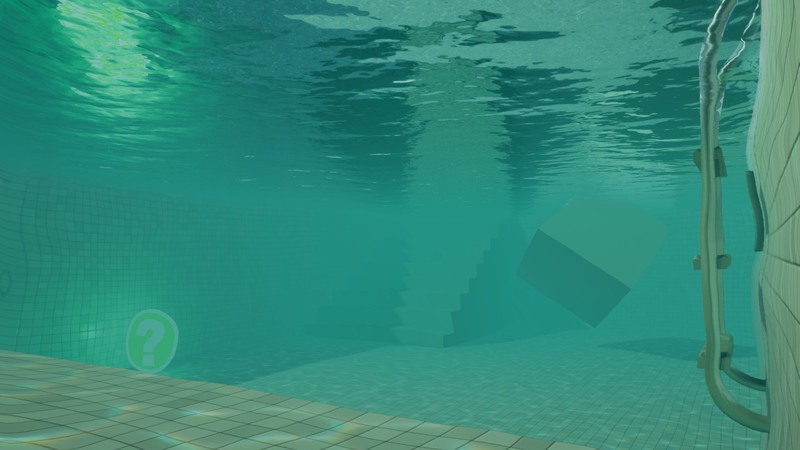 Use Multireflection Blocks reflected rays from sampling the cube-map under the water, reflects the ray again. It gives better results when using very high waves. Use Sun Allows using second normal texture source. Use Sun Half Vector An alternative method of calculating specular reflection based on half vector instead of reflection. Little different result. Sun Color Color fo highlights. Sun Intensity The intensity of highlights. Sun Shininess The shininess specifies how small the highlights are: the shinier, the smaller the highlights. Glittering Power High power of glittering increases lighting points intensity. Glittering From Sun How the position of the sun affects the Glittering effect. Glittering Clamp Max glittering emissive value. Refraction Simplified refraction effect based on UV shifting on waves. Translucency Alpha blend translucency on the coast. Should be very low it conflicts with the refraction effect. Use Coast Foam Activates additional coast foam effect. Coat Foam Color Coast foam color multiplier. Width in the alpha channel. Use Distance Fade Activates translucent fade effect on the horizon. Disatnce Fade Min Minimum distance from camera to start fade. Distance Fade Width The width of a fading area. 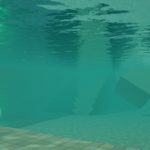 The M_AquaticUnderWater is a waterplane surface rendered from under the water. This material mainly represents the effect of refraction and reflection under the water. This material should be used on plane meshes aligned horizontally with normals directed down. 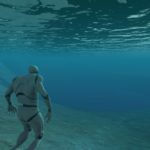 Find the M_AquaticUnderWater* material that you want to modify from the example library of materials. Click right select duplicate option on the material. Rename to your water. It is good practice to have a clean naming convention like M_AquaticUnderWater+River/Lake/Ocean. Refraction Refraction coefficient <1.0, 2.0>. Screen Refraction A coefficient of screen color refraction. 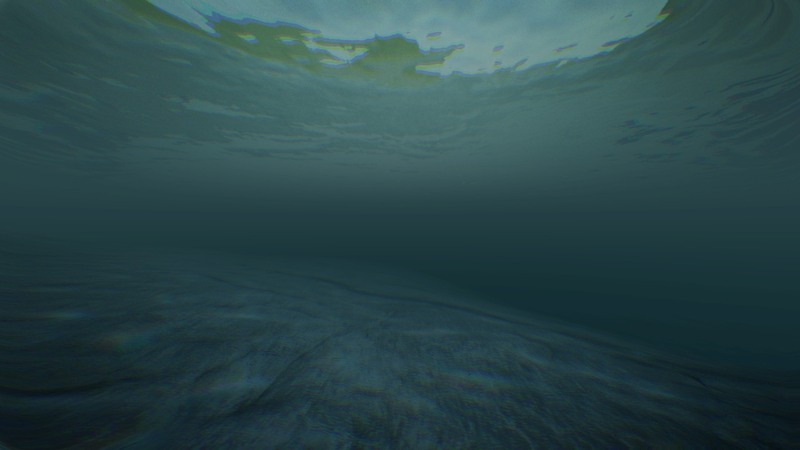 Makes that meshes close to the camera can be seen from underwater. Use Sun Specular Allows using sun specular effect. Sun Specular Shininess Shininess parameter of the sun. Sun Color Sun color multiplier. Scale encoded in the alpha parameter. 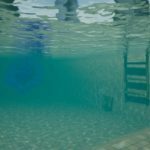 The M_AquaticVolumeWater is a custom post-process effect rendered before translucent. 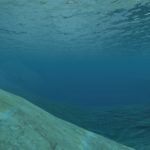 Ths material visualizes the underwater ‘fog’ and wet surface. 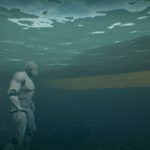 The fog parameters should be set in BP_AquaticSurfce blueprint because these parameters are shared between multiple materials (like translucent). Use Fog Allows using the build in fog effect. Fog Color Sets the color of fog. Use Fog Exp 2 The exponential types provide more natural looking fog and make the edges appear smoother. When disabled fog works in linear mode. Use Fog Scattering Allow to using the second color of fog near the water surface. Use Fog Wet Surface A color multiplier of the wet geometry near the surface fo water. Fog Wet Color Surface A color multiplier of the wet geometry near the surface fo water. Fog Wet Color Color multiplier f the wet geometry. The M_AquaticScreenWater a post-process effect that visualizes the distortion vignette and water plane clipping line. This material should be used in the post-process volume. Use Water Line Allows displaying waterline effect. 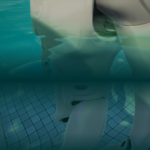 Can be disabled to optimize if you are not going to display the water line (for example when the game is located fully underwater). Use Water Line Refraction Allows displaying water line distortion effect. Use Water Line Exp Allows using exponential waterline cover and distortion. Use Water Line Noise Additional noise from full-screen texture can be used on the waterline (experimental). Water Line Color The color multiplier for waterline effect. Water Line Refraction Water line refraction scale (better results with small negative values). Water Line Refraction Width The width of the refraction effect. Fade in distance from the water line. The width of the water line on the screen. 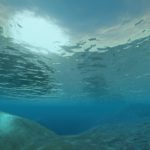 Use Texture Distortion Allows using underwater full-screen distortion effect. Use Vignette Allows using underwater vignette effect. 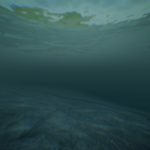 Use Vignette Distortion Allows using underwater vignette distortion effect. Vignette Distortion Vignette distortion scale. Vignette Dark Scale of vignette dark color. The M_AquaticCausticDecal material is the effect of caustics projected on the ground. The effect is animated using a simplified method based on animated textures. Caustics animation using a looped cycle based on 16 frames. Caustics decal should be used wich blueprint BP_AquaticCausticDecal prepared especially to update the animation. Find the M_AquaticCaustic* material that you want to modify from the example library of materials. Drag and drop Blueprints/BP_AquaticCausticDecal on your scene. 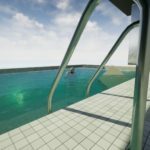 Set created material to the Dynamic Material parameter in BP_AquaticCausticDecal on your scene. Light source Decal casting direction. Directional light from the scene. Textures List of textures used in decal animation. Animated caustics. Animation Speed Caustics animation speed (frames per second). Dynamic Material The material of caustic M_AquaticCaustic to use. UV Scale Caustics texture UV scale. UV Move Caustics texture UV movement in time. Color Caustic color multiplier. Saturation power encoded in the alpha channel. Blur Max Castaic maximal mipmap level used near the coast. Emissive Additional emissive lighting effect in the shape of caustics. Shadow Fade Width Transition length from No shadow(near water plane) to shadowed (deep in water). Sun Fade Scale Only faces directed in front of the sun will be covered by caustics. This parameter allows scaling the disappearing. Sun Fade Shift Only faces directed in front of the sun will be covered by caustics. This parameter allows shifting the start point of disappearing. Saturation The saturation of caustics texture. Use Wet Reflection Allows using specular reflection on the wet ground. Wet Reflection The intensity of specular reflection on the wet ground. Use Water Hight Clip Allows using clipping the decal effect by water plane. Fixes visibility when the decal projection is the higher than the water plane. Water Height Waterplane height on the scene. Water Height Fade Fade of decal near the water plane. Wave effect is based on two moving normal maps. The system supports two types of wave effect animation in UV Transform and Water Flow. 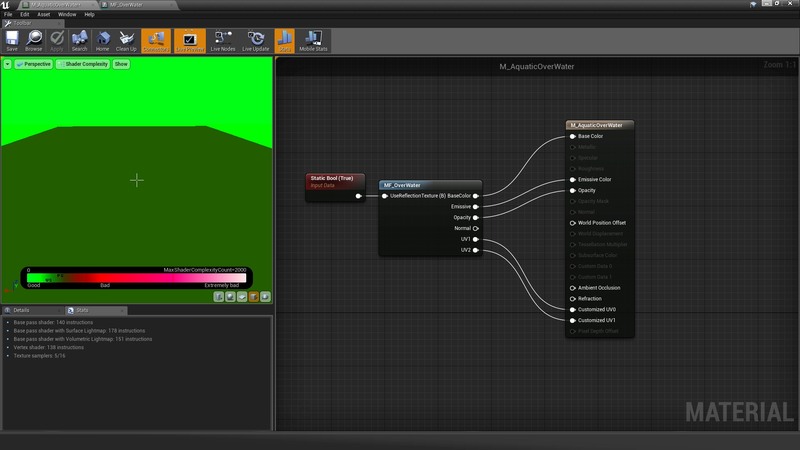 To switch between these two types of UV just change Use Flowmap option in the material. 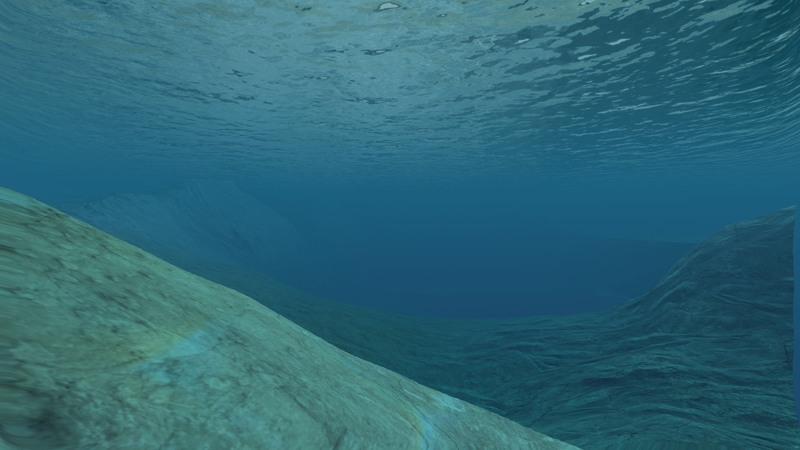 UV animation is supported by overwater surface as well as the underwater surface. Use the flow-map texture instead of vertex colors. R and G is an X and Y axis speed of layers. The directions can be inverted as negative. Parameter B is the time scale of a flow map cycle. Parameter A scales the flow map UV. The parameters R and G represent the movement on axes X and Y of UV map 1. The parameter B scales the UV. The parameters R and G represent the movement on axes X and Y of UV map 2. The parameter B scales the UV. Use UV Texture coordinates instead of world space position. Can be useful for rivers witch specific mapping. Changes the normal map blending types. There are three types of normal map waves blending. Standard linear (fast), advanced whiteout /UDN. Read more: Blending modes. Normal Scale Scales the normal vectors. Allow making waves higher or more flat (change B value to higher to make it flat). Normal Texture Normal texture source. Use Normal Texture 2 Allows using second normal texture source. Normal Texture 2 Second normal texture source. UV Transform mode is the fastest and simpler method just moving and scaling the normal map layers UV coordinates in time. This mode is enabled when UseFlowMap is set to false. In this mode, two scaled layers of normal maps are moving linearly in a defined direction. The configuration of movement speed and scale can be changed in UV Move Sale 1 and UV Move Sale 2 parameter. 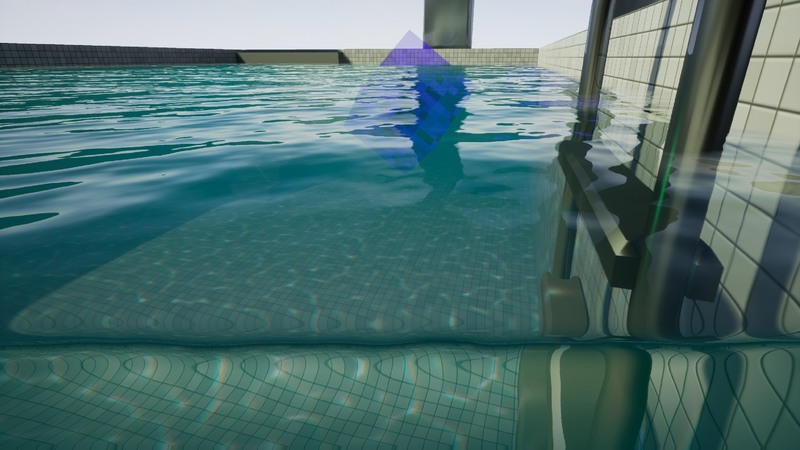 Water flow is one of the coolest methods of water animation, first introduced in Portal 2 presented on SIGGRAPH 2010. 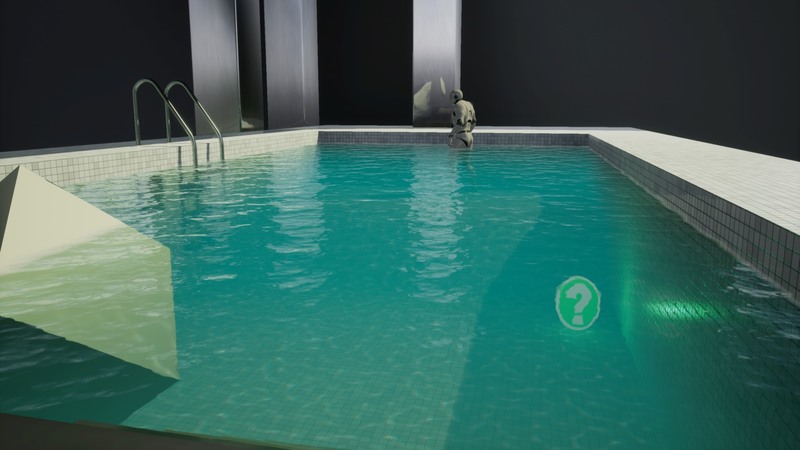 The basic idea in this method is to move the UV of the water textures according to direction vectors drawn on the surface. Texture-based flow mode uses textures that can be prepared in an external tool like FlowMap Painter. Those textures should be loaded as vector displacement maps because of data precision that is important to achieve the best possible visual effect. 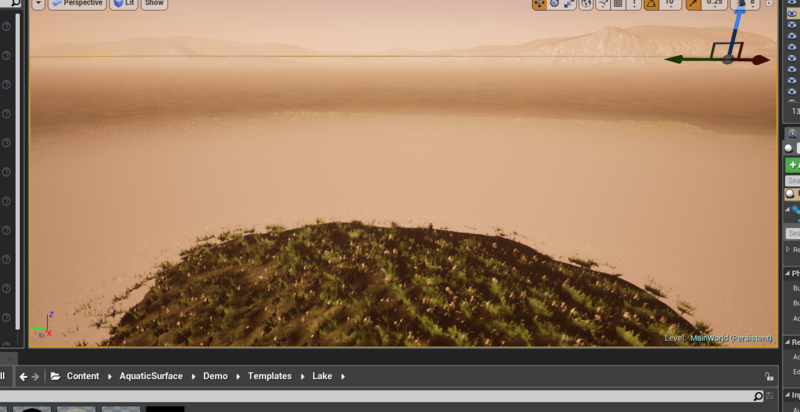 There will be a special tool for creating flow map textures in Unreal Engine Editor in the future version of Aquatic Surface package. Vertex-based flow mode is the more interesting feature because does not require any additional textures only mesh used for effect should be tesselated (divided on multiple triangles). You have to decide how many verticles do you need to draw your flow on the mesh. Vertex-Based flow editing tool preview. 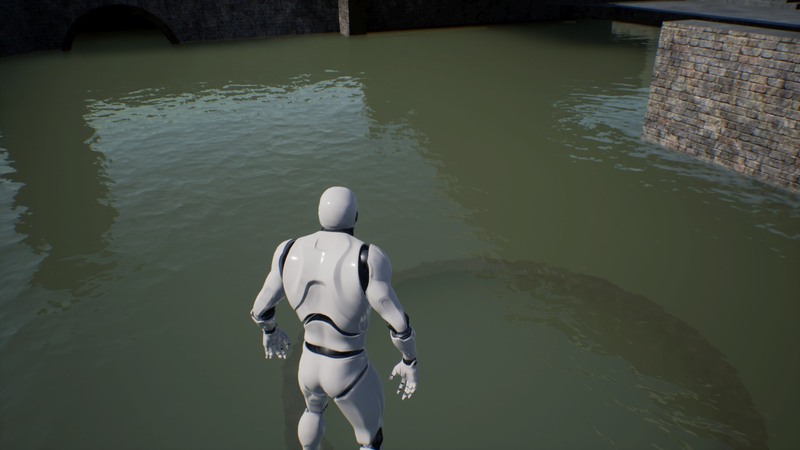 The process of editing water flow per-vertex is a little inconvenient because there is no tool for this in UE4 editor. I didn’t want to transform this package into vertex-flow editor plugin because it’s not the idea of Aquatic Surface. I’ve decided to use Vertex Paint editor and create additional tools for previewing the results of changes that make the whole process little more convenient. Switch the option UseFlowMap to true to use the flow map feature on water. Change mesh density according to your requirements of precision. If the material is not reacting on vertex color brush then probably you should use mesh with higher density and select the mesh component to paint. Switch the option UseFlowmapToolthe to true in the overwater material to see debug vertex flow preview. Select the mesh to paint on. Use random value on the blue channel to force noisy transition between normalmaps. After finished work, you have to propagate changes to mesh to save the data. 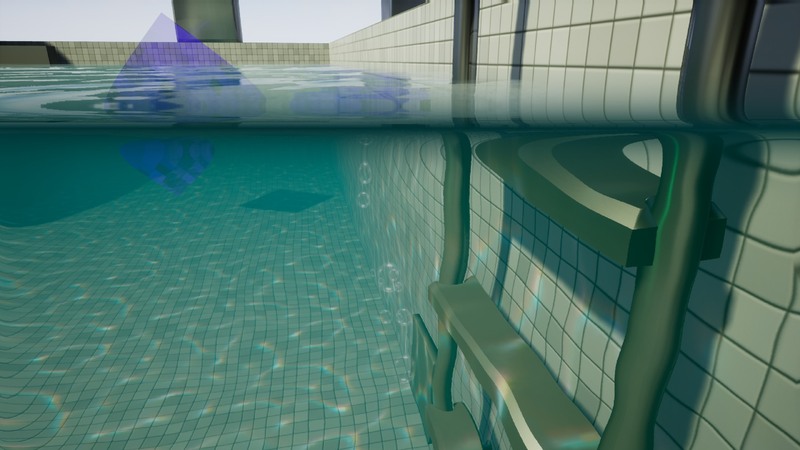 The Aquatic Surface package supports translucent materials. 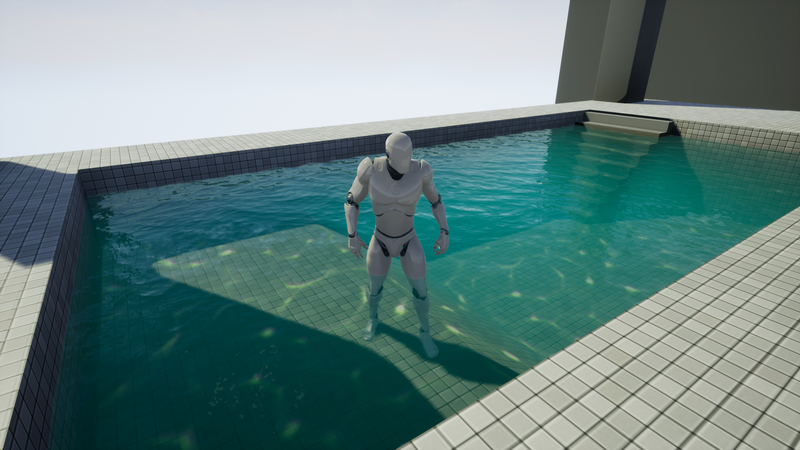 This effect is very limited by the material system and requires to add special material node MF_AquaticSurface to the translucent material that will be used on an object in the water. This effect is implemented by fading the translucent objects depends on the distance from the camera. MF_AquaticTranslucent node in materials. 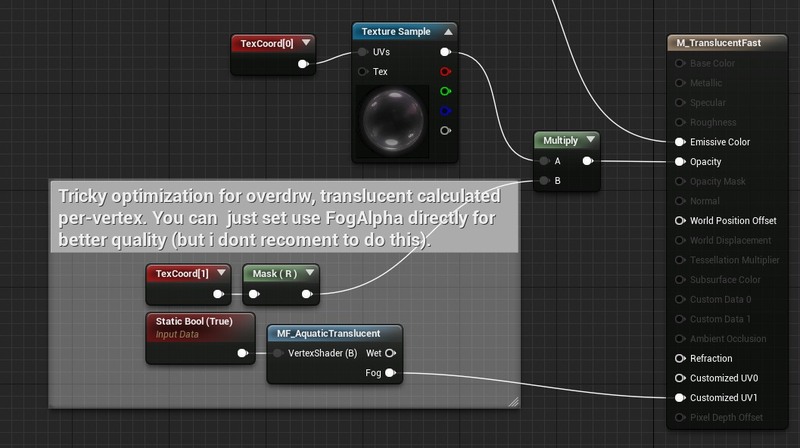 Fog is stored in vertex coordinates that allow moving calculations into vertex shader. M_TranslucentAdvanced – Advanced translucent effect calculated per pixel. Can be slow but very accurate. M_TranslucentFast – This material is using Vertex Interpolation. It’s a fast method to implement this effect. 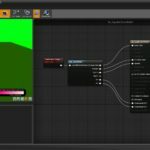 M_TranslucentDither – Traditional dither material used in UE4. Translicent example, particles(fast) and box (accurate). 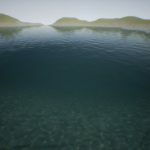 All BP_AquaticSurface actors use the same shared Render Target reflection texture so it is not possible to generate the textures for multiple water reflections at the same time. However, the system can be configurated to use static prebaked cube maps and it solves that problem. Select the water actor on the scene. Clear the Static Reflection Cubemap value if is set. This will force the system to render reflection into the cube-map texture. Click reconstruct property to refresh the texture. 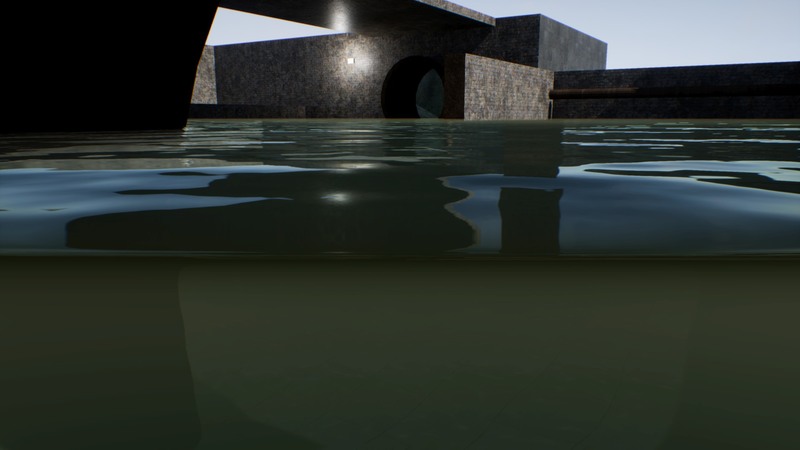 Set the newly created texture into Static Reflection Cubemap parameter in Aquatic Surface actor. Repeat all steps for all Aquatic Surface actors on the scene. Probably you have some questions. For example WHY the hell I have to do this? Thanks to using static cube map textures your game will load and work very fast even on mobile and VR. 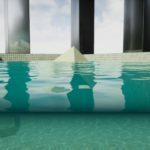 It’s far better solution than dynamic reflections used in other water systems. Update volumes in the tick event. 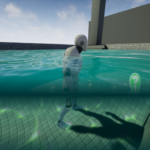 Known issue (hard to fix): In the editor mode underwater is visible only for a lastly loaded actor so before start previewing underwater effect please click Reconstruct in selected Aquatic Surface actor to be sure that it’s loaded. There is a simple solution for holes in water planes that can be used for boats. 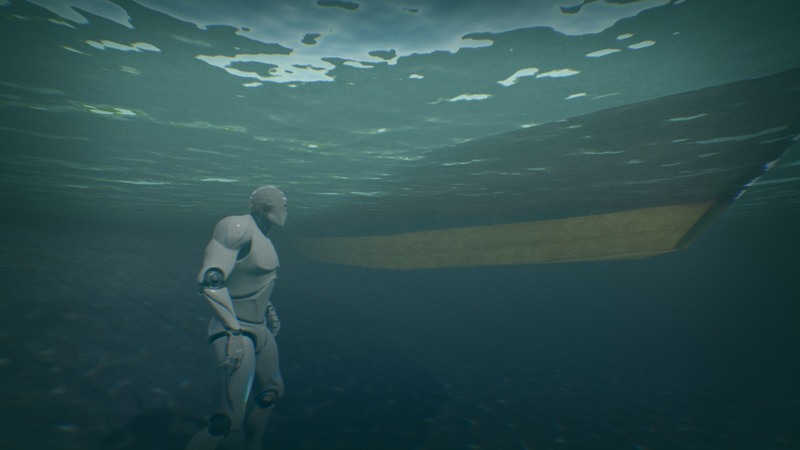 You just have to create a mesh that will be rendered inside the boat and use material M_AuaticHole. Check the example boat. Hole in water plane example boat. This feature requires screen color sampling so it is not supported on mobile platform. 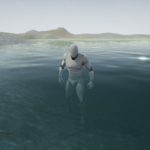 Set UseInteraction=true parameter in the overwater/underwater material used in the water surface. 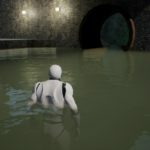 Drag and drop BP_AquaticSimulation actor on the scene. 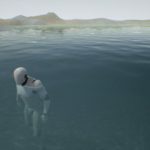 Set parameters of the BP_AquaticSimulation. 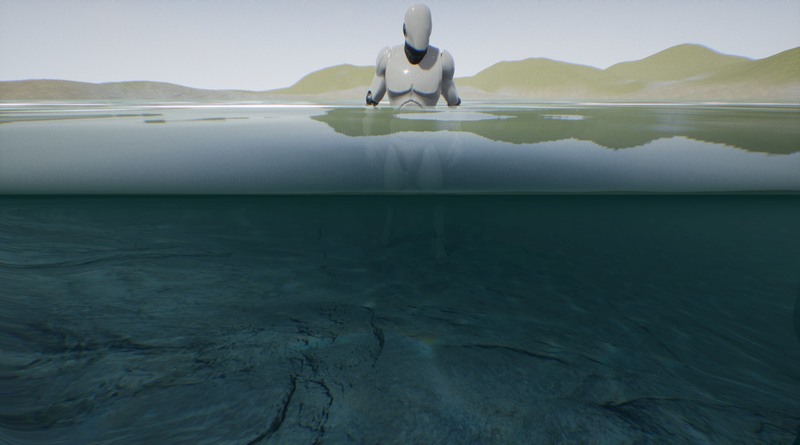 Add the BP_AquaticSurface from scene to AquaticSurface list. 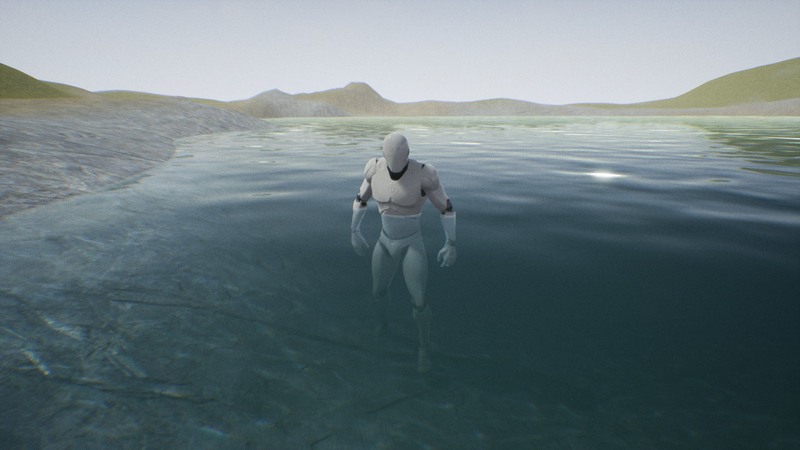 Add the BP_AquaticInteration component to the actor that is going to interact with water. AreaSize Size of simulation area. AquaticSurfaces List of surfaces managed in the simulation. Interp Speed The speed of simulation area interpolation to important place on the map (where something is moving in water). DrawDebug Preview the are of simulation. Animation Rate FPS of simulation. Wave Travel Speed Simulated wave speed. Wave Normal Scale Normal-map wave vector scale. Materials Three render target textures used for rendering the simulation. Can be replaced by textures with the higher resolution. 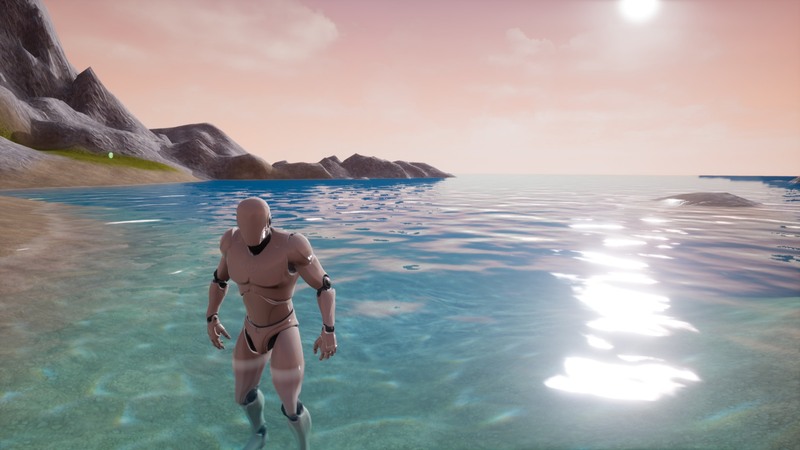 Component Based – Actors that contains BP_AquaticInteration will be registered in water surface and make waves when moving. Check the example Character blueprint with left/right foot interactions connected to the foot bones in the construction script. Event Based – Interaction can be generated on the event for example hit/explosion by executing the AddInteraction function on Simulation blueprint. The simple example presented in LakeMap level blueprint. Dynamic Noise added when actor stays in place. Force How much location change generates the waves. Torque How much rotation change generates the waves. Height Fade Fade out of interaction when it is far from the surface. Importance Bigger importance means that region should be moved to show the effect. Max Velocity Max velocity of waves generated from this interaction. Allow clapping the forces. Max Distance Max distance from interaction to the center of simulation area. Useful for a player that should always interact with water. How fast it is where is a bottleneck? It takes about 0.06ms per frame for render the simulation in 256×256 texture that result is reasonable even for VR games. Update of the interaction component is the biggest bottleneck of the algorithm because of the slow math evaluation in the blueprints. That is why you should consider minimization the number of interaction components in actors or aquatic simulation blueprint nativization. 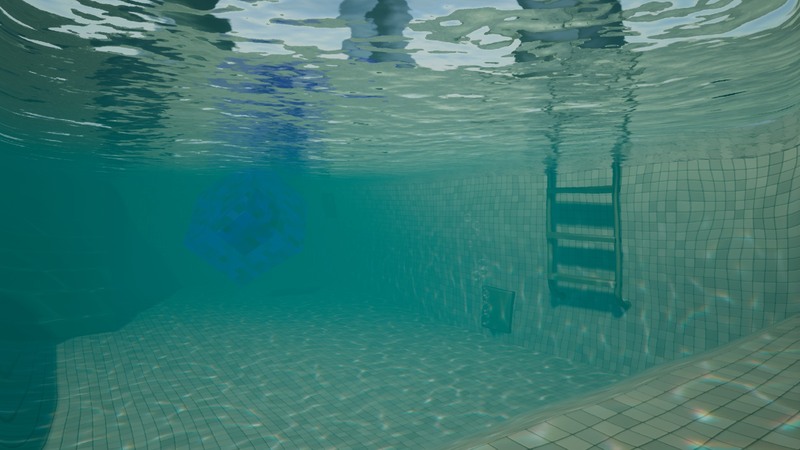 Aquatic Surface supports fast simplified buoyancy system for physics actors. 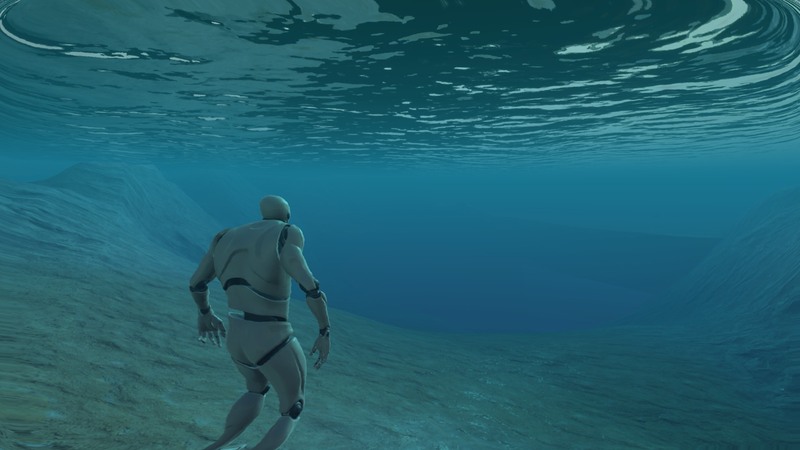 Example of using buoyancy is presented in the BP_AquaticBuoyancyActor. Shape The shape of the object that will be reacting to water. Cone shape is the best choice for Boats – if deeper is object the force of buoyancy will be higher. Shape Radius Used for calculating the density of the object. 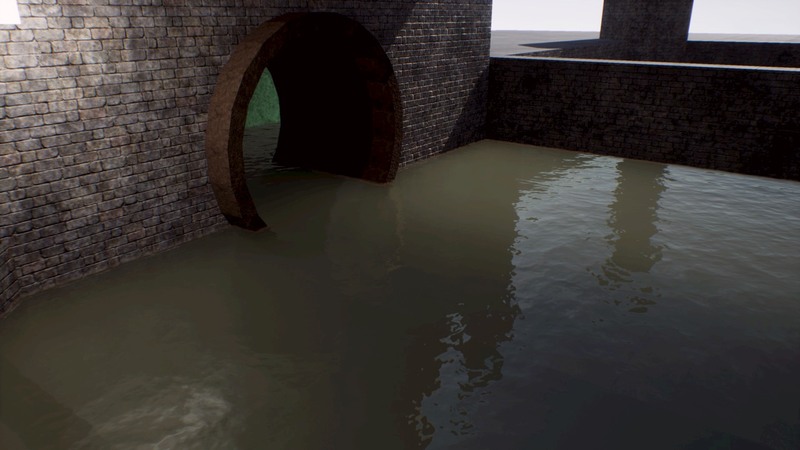 Linear/Angular Damping Allow controlling how much object is slowing down in the water. Center of mass The position where the force is applied to the object. Boats should transfer the center of upper higher to be more stable. Force scale Scales the force applied to the physics object. This looks awesome. 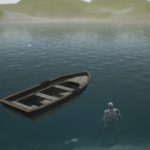 Think you can look at mobile or VR compatibility? I know translucency hits VR pretty hard in forward rendering. Any way maybe keep a VR instance of the material in mind when developing the package? 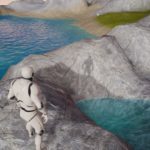 Thanks again for all your contributions to the UE4 community! Yes, translucency is the biggest problem in this case. I’ve checked VR and it works almost the same as PC 🙂 It’s only 150 instructions so I believe should be ok. Mobile is harder to support because I can’t read screen color in materials but still looks good on ES2 https://ibb.co/fBY9Z9 https://ibb.co/dqaObp. Is there a way to Eliminate the Clip Plane on the Materials? 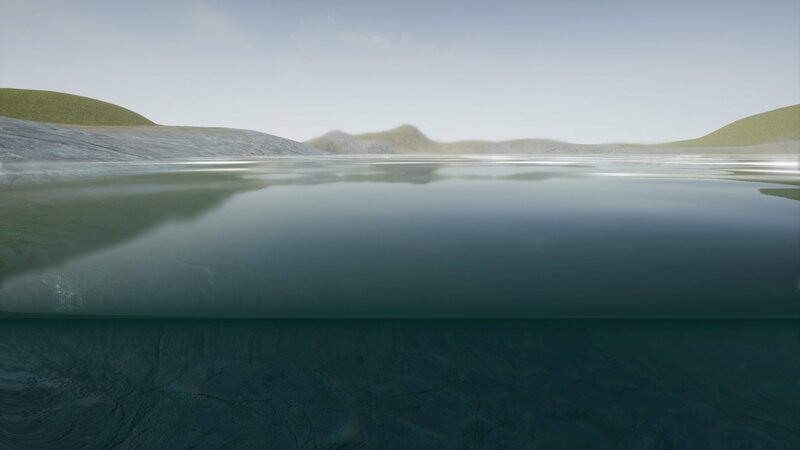 I’d Like to use the MF_Overwater as a horizontal material from the side (Such as when viewing into an aquarium). 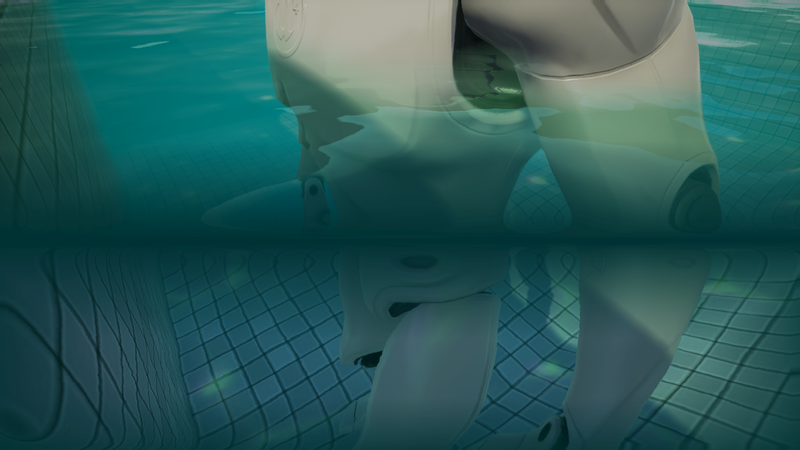 The clipping causes the material to appear to detach from the MF_Underwater surface when viewing at certain angles. Could you show me some examples and the bugs that you see? The material is not supporting rendering on vertical planes but maybe I will be able to add this feature. Hard to say, probably incorrect reflection volume settings. Is there any chance that you will send me the project to test it? I’m looking into this right now. 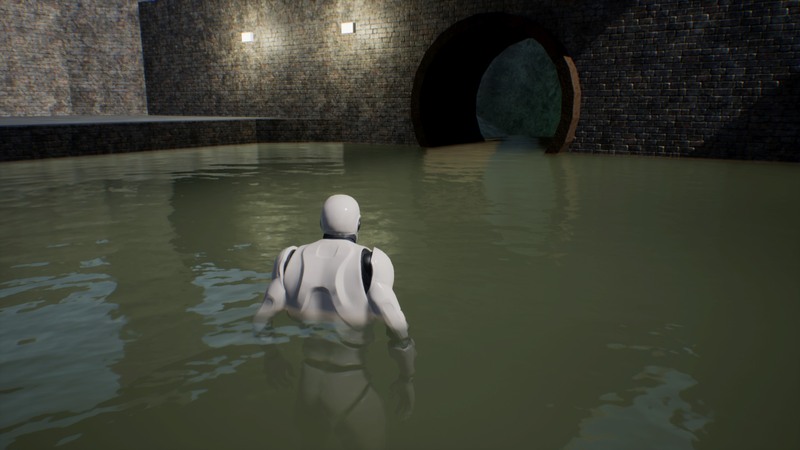 Tell me please, which version of the UE4 you are using? 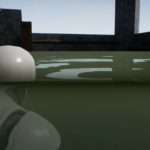 Is it ok in the UE4 preview? Hi, I bought this water system a few days ago. I found that the water area will be eaten while camera near the water , do you know how to fix it? Could you show me on screenshot/video? What do you mean by “will be eaten “? I haven’t noticed any bugs. Sorry I am not specific . unfortunately I can’t provide a photo because I tried to drag a new one(BP from template) then it all went well . I think maybe it’s my misusing . 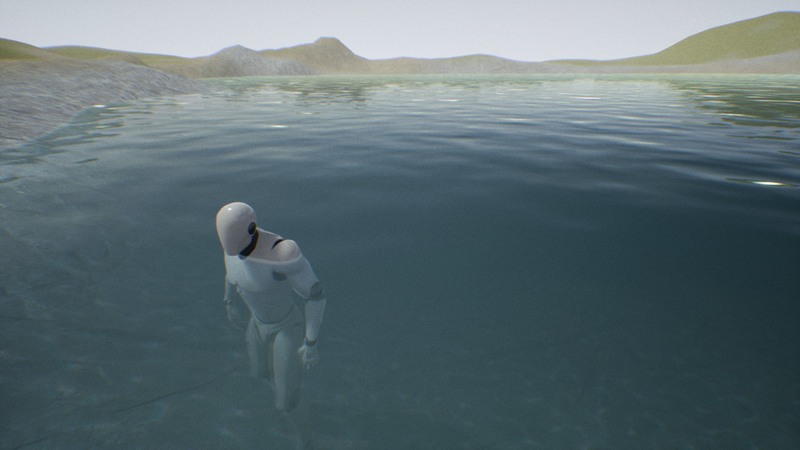 Krystian, could you help me to set up your water surface? I like how it looks generally and I will use it in my project if you can help. The problem is that your water script has too few manuals. 1. For example, it calculates a reflection from one dedicated point, but I guess it should recalculate the reflaction when player moves. If player will go to another point far from start, reflection will not be shown correctly. 2. When I am rotating a camera, in some angle water becames another color (almost black). It’s very unrealistic and annoying. If turn back, water becames normal color again. How to fix it? (I can send you a video with this effect). 3. How to add big waves? (or any waves). 4. 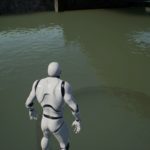 How to turn the interaction with water on? Please, could you make a 1-2-3 steps manuals for setting up your water script from package? I copied it from the demo tool, and I also created an aquotic caustic (but even here, in this manual, there is no information that we need to copy aquotic caustic also.) But after that I still have problems described. Please answer me here or by email. I hope, that good manual will help to many new clients use your work. 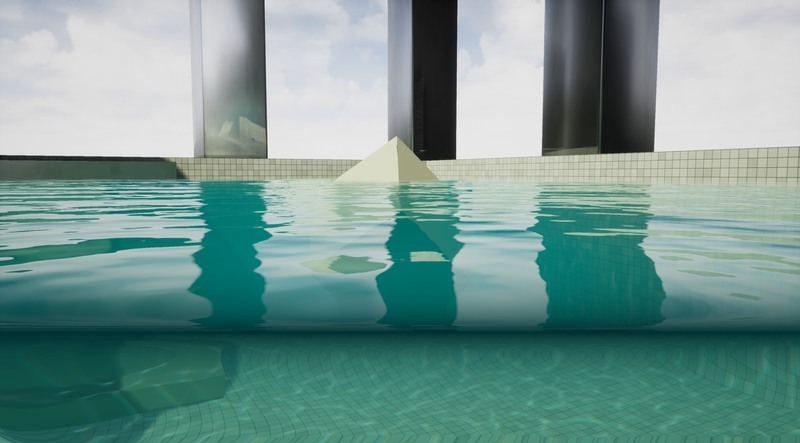 M_AquaticOverWater_SSR(Slow) – SSR reflections on translucent material, requires mirror plane to look good. 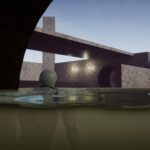 M_AquaticOverWater_UNLIT(Fast for mobile) – No lighting just reflection cubemap and coloring. You can choose which quality of reflections do you need but box-projected mapping is recommended by me. 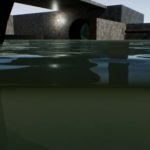 Using box projection you will get the best reflections in the box set by Reflection Box parameters in the blueprint you just have to adjust the box of reflections to your scene. 2. Send me a video please I believe it can be fixed. 2. This water planes are flat there is no functionality for waves (this limit is forced by waterplane effect). 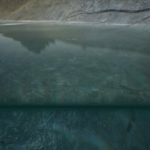 It is system prepared for lakes – not oceans. 4. Check the example map and video tutorial video on my site, you just have to add the interaction component into your interactive actors and enable the interactions in the material. Everything is in the Interactions chapter.